A catalogue of the Ashmolean’s collection of warriors by Utagawa Kuniyoshi (1798-1861) by Oliver Impey and Mitsuko Watanabe (published Oxford, 2003). Sakai Masahisa, ?-1570, (here Sasai Ukon Masanao) was the father of 'Sasai Kyūzō Masayasu' (see No.15) [EA1971.59], and was a faithful vassal of the Oda family. When Oda Nobunaga had confronted Asai Nagamasa (1545-1573) and Asakura Yoshikage (1533-1573) at the bottom of the Mount Hiei in 1570, Masahisa was sent to Kenta, where the food for Asakura's army sent from Echizen was on the seashore. Masanao gained support from local men such as 'Baba Magojirō' in order to guide him, secretly gathering his men and ships in order to steal the supplies. During the night, Masanao ordered his men to shout their war-cry, causing Asakura's guards to run away from the shore. Masanao then put the food into his ships which he himself was supposed to take back to Nobunaga's camp. While Masanao was waiting for the next ship to take him and his men back, Asakura's guards informed their lord what Masanao had done. Masanao and his men were finally killed by Asai's and Asakura's armies. 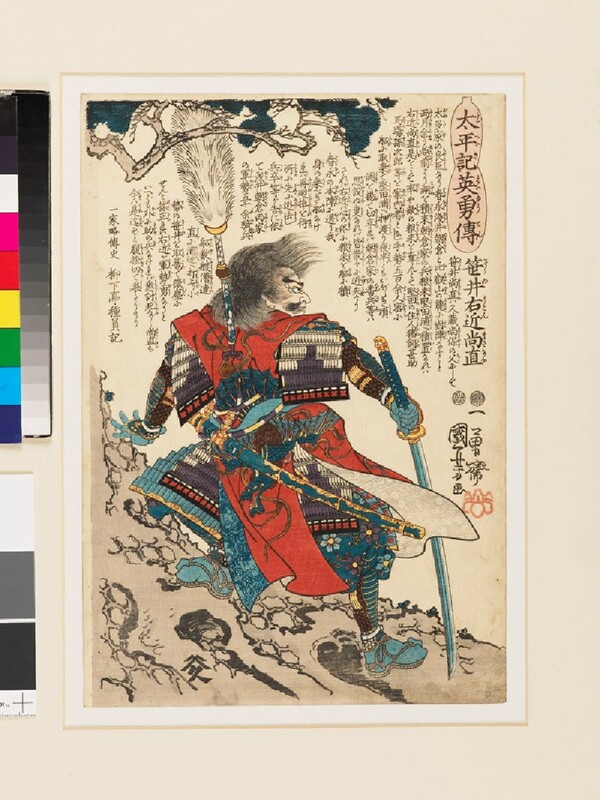 This print shows 'Masanao' standing on a huge tree trunk and waiting for his ship before the final attack and his death. Presented by George Grigs, Miss Elizabeth Grigs, and Miss Susan Messer, in memory of Derick Grigs, 1971.